As Japan and China continue to exchange angry words over their competing claims to an uninhabited group of islands in the East China Sea, it's not that easy to get a close look - and sometimes a little deception is required. When you arrive in a new country as a foreign correspondent, the first thing you try to do is figure out how that country works. Japan, where I arrived three months ago, has a reputation for being particularly complex for foreigners to understand. And so it is proving. 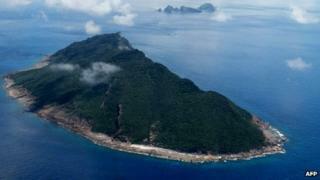 Take for example the little trip I recently took out in to the East China Sea. The objective was the Senkaku Islands, as they are known here in Japan. If you live in China they are the Diaoyu. I'm just going to call them The Islands. As you may have heard The Islands are currently the subject of a very acrimonious dispute between Japan and China over who owns them. The Japanese government has banned everyone - including Japanese citizens - from landing on them. You are, however, allowed to go fishing in the waters nearby. But before we could set off we had to undergo an inspection by the Japanese coastguard, and this is where things started to get interesting. The coastguard officers were extremely polite and friendly. They were also surprisingly thorough. They wanted to see our fishing equipment, rods, reels and bait. They even wanted to see whether there really was ice in the boat's fish lockers. Then came a question I was not expecting. "What is the purpose of your trip?" the senior officer asked me. I hesitated, wondering whether I was really expected to lie. "We're… um… going… fishing!" I said. The officers looked pleased and nodded sagely. "Fishing, yes, good, good." All of this was being filmed by my colleague, Jiro San, with a large television camera. We had made no attempt to hide our equipment or who we were. But the charade appeared to be important. And it didn't end once we were at sea. After eight hours of sailing we approached the islands under cover of darkness. On the radio the Japanese coastguard was calling our captain. "We are preparing to come aboard," they announced. Through the darkness a pair of speedboats were sweeping towards us. Our captain and his two crew now immediately sprang in to action, pulling out fishing-rods and reels and setting them up on the back of the boat. "We need to look like we're fishing," they giggled. Then as dawn broke over the islands and we began our filming, our shipmates really DID begin fishing. They pulled aboard at least a dozen beautiful big red snapper which slapped around on the deck at my feet. "They'll want to see these when we get back," our captain smirked. For the next few hours everyone lost interest in fishing. The Chinese had arrived in the shape of four maritime surveillance ships. The Japanese coastguard was now much more interested in keeping the Chinese ships away from us, than us away from the islands. It was all quite exciting as a slow-motion game of chase around the islands ensued. But when we finally did get back to the small Japanese island of Ishigaki after 24 hours at sea there were our friendly coastguard officers waiting for us. "How was the fishing?" they asked. I thought, "Are you serious?" Apparently they were. So what does this tell us about Japan? Well, I think it shows the tension in Japan between the need to apply rules, and the deep desire to avoid conflict. Rules are very important here. Japan is a highly structured and hierarchical society. There is a rule and regulation for everything - but there is also a huge fear of conflict. And so Japanese people have learned to negotiate the web or rules, to interpret them, while still making sure they have covered their behinds. Something very similar happened when I went to get my Japanese driving licence. British people are, in theory, allowed to swap their British licence. But there is an obscure regulation that was nearly my undoing. I had to be able to prove that I'd lived in the UK for one year after obtaining my most recent licence. "How am I supposed to do that?" I fulminated. "I haven't lived in the UK for 20 years!" The gentleman at the licence office looked pained, and then suddenly his face brightened, he had an idea. "When did you take your driving test?" he asked. "So you have a degree certificate from a UK university?" he asked. Brilliant. He had his piece of paper, I had my Japanese driving licence, and conflict had been avoided. It was the same with our friendly coastguard. If challenged by a superior he had done his job. Our captain had made sure we had fish to show him. And we had our precious filming. Of course no-one was REALLY ever in any doubt about what we were up to.